A pair of classic comedies from the 1980s that share the same director in John Landis and the same star in Eddie Murphy, Trading Places and Coming to America are both celebrating anniversaries this year, and are getting brand new Blu-ray releases to honour the occasion. Released to wild success in 1983, Trading Places tells the story of two insider traders Randolph (Ralph Bellamy) and Mortimer Duke (Don Ameche) who make a bet about nature versus nurture, and enact a cruel social experiment in which they fire their top broker Louis Winthorpe (Dan Aykroyd) and hire the homeless grifter Billy Ray Valentine (Eddie Murphy) in his place. With a clever script, and standout performances from the ensemble cast which also includes Jamie Lee Curtis as a street-smart prostitute, Trading Places remains a bonafide comedic classic that unfolds with shades of Frank Capra. The film also functions as a pointed and still relevant social satire, using its rags to riches and riches to rags story to touch on bigger themes of race and class, and how the same person is treated differently when their socioeconomic status changes. It’s a wildly entertaining film that still holds up, bolstered by one of Eddie Murphy’s finest roles. 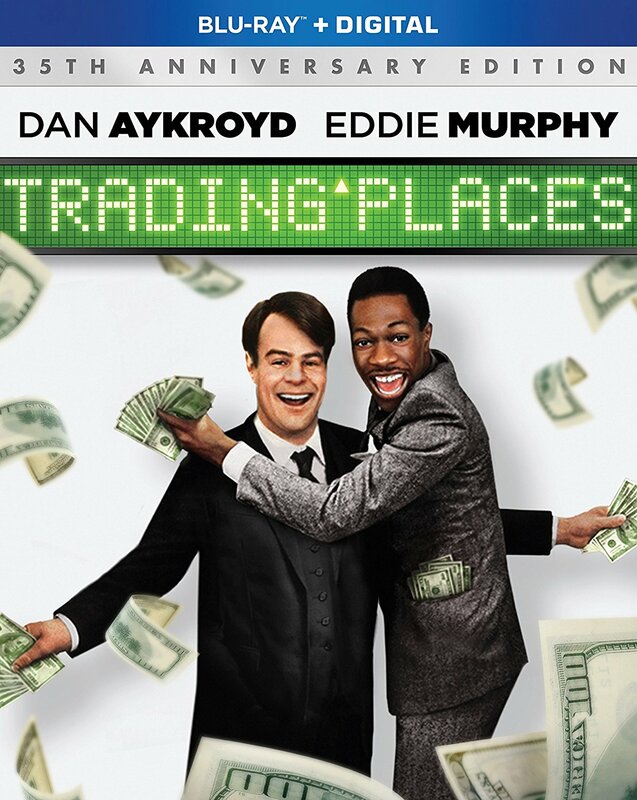 The Blu-ray also includes the featurettes Insider Trading: The Making of Trading Places, Trading Stories, Dressing the Part, and The Trade in Trading Places, as well as a deleted scene, an industry promotional piece, and trivia pop-ups. 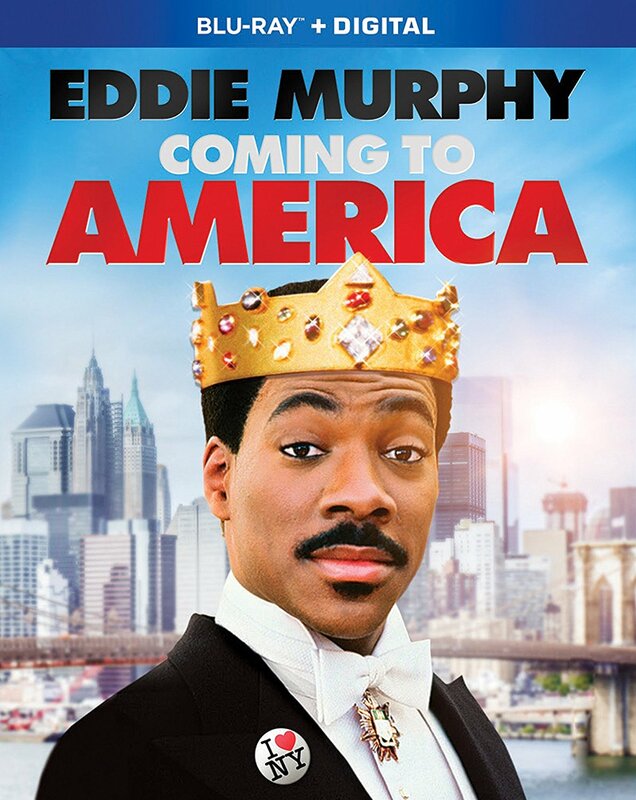 Released five years later, Coming to America in a lot of ways served to capitalize on the critical and commercial success of the earlier collaboration between its director and star, and became one of the highest grossing movies of 1988. This time around, Eddie Murphy takes on the role of Prince Akeem, who hails from a fictional African nation called Zamunda, and doesn’t want to marry the bride that his parents (James Earl Jones and Madge Sinclair) have chosen for him. So on his 21st birthday, he travels to Queens, New York with his servant Semmi (Arsenio Hall), to pose as a regular man and find his own true love. While Coming to America isn’t quite as good as Trading Places – the characters aren’t as well defined, and the screenplay feels looser – it’s still an amusing comedy that explores similar themes about how people are treated differently depending on if they are seen as rich or poor. The film delivers several classic scenes, and features cameos by Ralph Bellamy and Don Ameche reprising their roles from Trading Places, allowing it to serve as a followup of sorts. It’s also notable for starting the trend of Eddie Murphy playing multiple characters, with him and Arsenio Hall utilizing Rick Baker’s Oscar-nominated makeup work to show up in different roles throughout the film, including as the hilarious denizens of a local barbershop. The Blu-ray also includes the featurettes Prince-ipal Photography: The Coming Together of America, Fit for Akeem: The Costumes of Coming to America, Character Building: The Many of Faces of Rick Baker, Composing America: The Musical Talents of Nile Rodgers, as well as A Vintage Sit-Down With Eddie and Arsenio, and a photo gallery. Trading Places: 35th Anniversary Edition and Coming to America: 30th Anniversary Edition are Paramount Home Media Distribution releases. They are both 116 minutes and rated 14A.